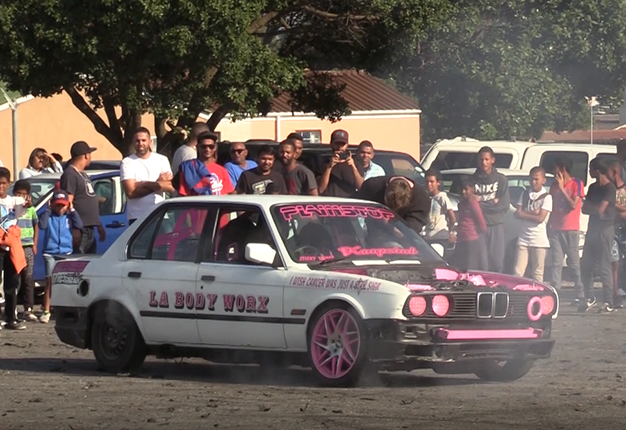 Plumes of smoke, people leaning outside the car and screeching tyres - those are all the trademarks of spinning, a sport that has grown leaps and bounds in SA. The most common cars used for spinning includes the BMW E30, Nissan Skyline and box-shape Toyota Corollas. There is just something about spinning that brings a crowd together all in the name of cars. Ernest Page visited a popular spinning spot in Cape Town to experience the sport firsthand. He met a few seasoned spinners before trying his hand at it, attempting to master the art in the process. Page rode shotgun in spinner Ismail Abraham's BMW E30. Once the smoke had cleared, he was able to experience spinning for himself in a baptism of (smoke) fire. After a bit of coaching and a number of unsuccessful 'crazy flip' attempts, he finally nailed it. The action didn't stop there though. Spinning isn't spinning without a bit of theatrics. Some drivers leap out while their vehicles are in motion. Of course there are extreme risks involved for driver and audience a like. I'm a 41 year old woman looking to meet men between the ages of 30 and 55.